Clark the Shark's mom is making brownies for school. But when Clark decides to taste just one, the impulsive shark can't stop eating! Yum-yum-YUM. Will the class treat be ruined With easy-to-read text and Clark's trademark rhymes, this chocolaty Level One tale will have beginning readers ready to take a bite out of reading! Also included are Clark the Shark's Bite-Sized Facts, real facts on shark communication, behavior, and more! 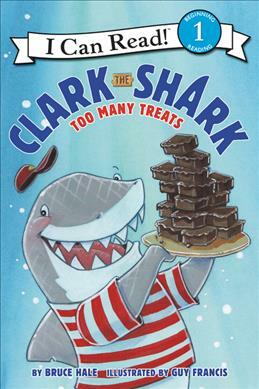 Clark the Shark: Too Many Treats is a Level One I Can Read, which means it's perfect for children learning to sound out words and sentences. Bruce Hale has written and/or illustrated over thirty-five books for kids, and is the author of Clark the Shark; Clark the Shark Dares to Share; the award-winning Chet Gecko Mysteries series; Snoring Beauty, one of Oprah's Recommended Reads for Kids; and the School for S.P.I.E.S. series. In his free time, Bruce enjoys hiking, watching movies, and making music. He lives in Santa Barbara, California, with his wife, dog, and many hats. You can catch him online at www.brucehale.com. Guy Francis spends most of his time drawing, painting, and drawing some more. He has done a variety of illustration work in the children's market, including editorial and educational illustration, chapter books, and picture books. He freelances from his home in Provo, Utah, where his wife and four children are his own personal art critics and bring a healthy bit of chaos to the studio. Every now and then he gets out of the house and heads to the mountains with his family. You can visit him online at www.guyfrancis.com.Readers will smile as Clark learns the true meaning of Christmas.